Innes NP is around 3.5 hours from Adelaide (via Minlaton, Warooka and Marion Bay). The Visitor Centre at the entrance to Innes is modern with clean toilets and helpful staff. Nearby is a tavern and general shop that sells cold drinks and small range of supplies (though not camping supplies). Throughout the park, all campgrounds and interest points are well sign posted. As this is a coastal park, beautiful scenery and beaches can be found – rugged coastlines with beaches with some big waves, so small children need very close supervision around the water, as at some beaches the undertow is very strong. Ethel Beach is stunning, with orange sand and pounding waves. There is a shipwreck on the beach, but all that remains is some jagged pieces of the boat, and hard to work out what it once was!. In the right light conditions, photographers will enjoy this beach. A number of campgrounds are available, and I have listed what I would want to know should I be a visitor to them. We describe how we found the camping area to be at time of visitation. 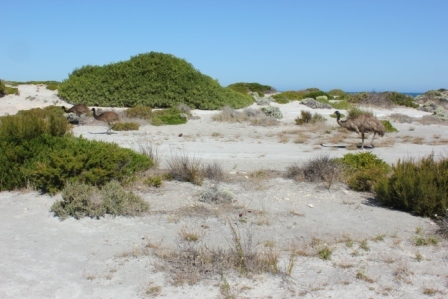 Around 25 sites, close to Little Emu Beach (maybe the name is derived by the numerous Emus that are all around this campground, though none came into our campsite). There appeared to be only 2 pit toilets, which seemed very old and were not in good condition. They had a dreadful odour and were extremely dirty. My children would not use them because of this. Would recommend bringing a chemical toilet if you have one. The sites themselves are good size, though there is very little screening between them, and what there is, is low lying scrub. Consequently, shade is not readily found. On a warm day, it could be unpleasant, so bring some sort of shelter/tarp to provide some protection. This Bay also bears the brunt of the breeze off the ocean (a few minutes from the campground), so once more protection from the wind and location is paramount in setting up your camp. Inch ants abound – they give a nasty bite, so be wary of them and avoid sites with too many. The bull ants were everywhere too, but at least they left us alone. HUGE flies also posed an issue, and insect repellent did not seem to bother them in the slightest – and they bite too!!!! This campground has enough space for caravans and trailers and generators are allowed there till 10pm at night. We only heard one generator which was turned off after a short period of time, but you might want to consider that when choosing a site. Very small campground, close to the main road, and once more not much privacy. No easy access to beach, and can be exposed to the elements. This campground is divided into tents and trailer/caravans. We are tent based campers, so drove in to the tent section, and found that each designated site is very small and fenced off, so spreading out is not possible. If you have a large tent set up (say 6 man tent or more), you will find your campsite to be cramped – after your tent is up, there will not be much room for much more. Some people had put their tents up in one campsite, and then had their kitchen and chairs etc, in another site – and these people did not have huge tents either but gives you an indication of the lack of space in each campsite. The sites are close together too, and screening is not great, so you will get to know neighbours whether you want to or not! Pit toilets are there, but as for the quality of them, cannot say. Have to walk a distance to get to the beach, but it was more sheltered from the breeze by large dunes. I had heard that this campground was the best of all campgrounds at Innes, so eager to check it out. I know it has only around 8 sites, so were very surprised on a busy weekend to find a spot still available despite being told it was full and "don’t even bother". Like Pondalowie, the set up is similar – small campsites and close together. Privacy between them is minimal. Well protected from the breeze (but on a warm day, you need that sometimes, so it felt about 5 degrees warmer in the campground). More shade than any other camp ground. The beach is about 5-7 minutes walk from the campsite – you have to go back onto the road and walk up to the car park and then to the very pretty beach. The beach was further than I had anticipated, and the children were expecting to be able to just go from the campsite to the beach easily, but that is not the case. Gigantic biting flies followed us entire time we were there too!!! Pit toilets are available at the campground. This used to be locked campground and needed a key to get in, as 8 only sites available. Apparently this is no longer the case, and entry is the same as all the other campgrounds. It is small, with small sites once more. Plenty of shade at some of them. No easy access to the beach. Anyone wanting to get a permit for the bush camping sites on Yorke Peninsula (as well as Innes NP) can also get these permits from the Visitor Centre (and the permit can be obtained over the phone).